Details on individual arcana cards for The Shipwreck Arcana. 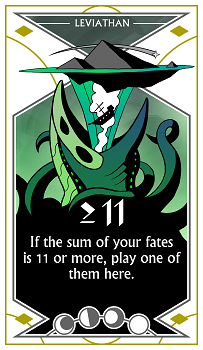 This section contains details on each arcana card in The Shipwreck Arcana, including how they play and frequently asked questions about them. "If you cannot play anywhere else, play one of your fates here. Then move it one card to the right." Q: How does The Hours work? A: The Hours is always the 5th card on the table, to the left of the 4 face-up arcana cards currently in play. You must play one of your 2 fates on The Hours if you cannot legally play either of your fates on any of the other 4 cards in play. If you can play anywhere else, you cannot play on The Hours. Once you play a fate on The Hours, you then move that fate one card to the right, so that it is now in front of the leftmost arcana card (that is not The Hours). This happens even though that fate could not normally be placed in front of that arcana card. This may also cause that card to fade at the end of the turn. The Hours card itself can never fade, as there will never be a fate in front of it at the end of a turn. In order to help the group remember that the active player played on The Hours, they can wait until the end of the turn before moving fates to the neighboring card. Q: What if I can't play anywhere except The Hours, but using a power (such as Shadows) would let me play elsewhere? Not use the power, and play on The Hours. Use the power, and play elsewhere. You are not required to use the power and play elsewhere. But if you do use the power and now can play elsewhere, you must play elsewhere. Not use the power, and play elsewhere. Use the power, and play on The Hours. "±1: If one of your fates is exactly 1 more or 1 less than the other, play one of them here." Q: How does The Beast work? A: You can only play on The Beast if your 2 fates are sequential. For example, if you are holding 1 and 2, 2 and 3, and so on, then your second fate is 1 more than your first (and your first is 1 less than your second). You can therefore play either of your fates on The Beast. This card functions similarly to The Huntress. "x3: If the sum of your fates is a multiple of 3, play one of them here." Q: How does The Belltower work? A: Add together the values of both of your fates. If that sum is 3, 6, 9, 12, etc, then you can play either of your fates on The Belltower. For example, if you are holding 2 and 4, the sum of your fates is 6, and you can play either one on The Belltower. If you play the 2, your allies will know that your remaining fate plus 2 produces a multiple of 3. This means you could have a 1 (1+2 = 3), a 4 (4+2 = 6), or a 7 (7+2 = 9). If you play the 4, your allies will know you have a 2 (2+4 = 6) or a 5 (5+4 = 9). "Free: Play one of your fates here. I don't further your doom when I fade." Q: How does The Blind Man work? A: You can always play either of your fates on The Blind Man, and doing so conveys no information to your allies... but also doesn't cause the doom track to advance when The Blind Man fades. This makes The Blind Man a "safety" play. Because it conveys so little information, it can also be a way to tell your allies that you can't play anywhere else, which may give them a lot of second-hand information. Because The Blind Man lasts for only 1 hour (it has 1 moon at the bottom), the first fate played on it will cause it to fade, granting the players its faded power for free! This can be worthwhile if you need more powers to complete predictions. "Tell: Play one of your fates here. If you do, say whether your remaining fate is higher than the one you played." Q: How does The Chalice work? A: You can always play either of your fates on The Chalice. Immediately after doing so, you then tell your allies whether your remaining fate is higher than the one you just played. Do so in the form of a "yes/no" statement, e.g. "Yes, my remaining fate is higher" or "No, my remaining fate is not higher." Remember, you can't say whether it's higher or lower. For example, if you are holding 4 and 4, you can play a 4 on The Chalice and then say "No, my remaining fate is not higher." This is because your remaining fate (4) is not higher than the fate you played (also 4). "Higher: If one of your fates is higher than the other, play the higher one here." Q: How does Dawn work? A: Dawn is one of the simpler cards, so there's not much else to say. You can always play the higher of your two fates on Dawn, unless both of your fates are exactly the same -- in this case, neither one is higher. This card functions similarly to Midnight. "≤5: If the sum of your fates is 5 or less, play one of them here." Q: How does The Deep work? A: Add together the values of both your fates. If the sum is 5 or less, you can play on The Deep. For example, if you are holding 1 and 3, the sum of your fates is 4, so you can play either fate on The Deep. If you play the 1, your allies will know that your remaining fate plus 1 cannot be more than 5, so you must have a 1 (1+1 = 2), 2 (2+1 = 3), 3 (3+1 = 4), or 4 (4+1 = 5). If you play the 3, your allies will know you have a 1 (1+3 = 4) or 2 (2+3 = 5). This card functions similarly to Leviathan and The Key. "Factor: If one of your fates is double or triple the other, play one of them here." Q: How does The Engine work? A: Choose your lower fate and figure out what its value would be if doubled and if tripled, then compare those values to your higher fate. If either one matches, you can play either one of your fates on The Engine. 1 and 4: 1 doubled is 2 and 1 tripled is 3, neither of which matches 4, so you can't play on The Engine. 1 and 2: 1 doubled is 2, which matches your other fate, so you can play either one on The Engine. 2 and 6: 2 doubled is 4, which doesn't match 6, but 2 tripled is 6, which does match, so you can play either one on The Engine. Your allies must remember that you can play either your higher or lower fate on The Engine. For example, if you play a 2 on The Engine, it could be because your fates were 1 and 2 (1 doubled is 2), 2 and 4 (2 doubled is 4), or 2 and 6 (2 tripled is 6). "±2: If one of your fates is exactly 2 more or 2 less than the other, play one of them here." Q: How does The Huntress work? A: You can only play on The Huntress if your 2 fates are sequential and 1 apart. For example, if you are holding 1 and 3, 2 and 4, and so on, then your second fate is 2 more than your first (and your first is 2 less than your second). You can therefore play either of your fates on The Huntress. This card functions similarly to The Beast. "Even: If the sum of your fates is even, play one of them here." Q: How does The Judge work? A: Add together the values of both your fates. If the sum is an even value (2, 4, 6, 8, 10, 12, 14, etc.) then you can play either fate on The Judge. If the sum is an odd value (1, 3, 5, 7, 9, 11, 13, etc. ), then you can't play either fate here. Remember that the sum of two even values is always even, and the sum of two odd values is always even, too. The only time that the sum of two values is odd is if one of the values is odd and one is even. So, if you play an even value on The Judge, your allies will know that your hidden fate is also even, and if you play an odd value, they'll know your hidden fate is odd. This card functions similarly to The Stranger. "7 to 9: If the sum of your fates is 7, 8, or 9, play one of them here." Q: How does The Key work? A: Add together the values of both your fates. If the sum is at least 7 and at most 9, you can play on The Key. For example, if you are holding 2 and 7, the sum of your fates is 9, so you can play either fate on The Key. If you play the 2, your allies will know that your remaining fate plus 2 equals 7, 8, or 9, so you must have a 5 (2+5 = 7), 6 (2+6 = 8), or 7 (2+7 = 9). If you play the 7, your allies will know you have a 1 (7+1 = 8) or 2 (7+2 = 9). There is no 0 fate, so the sum of your fates cannot be 7. While it may not be obvious at first glance, this card functions similarly to The Deep and Leviathan. "≥11: If the sum of your fates is 11 or more, play one of them here." Q: How does Leviathan work? A: Add together the values of both your fates. If the sum is 11 or more, you can play on Leviathan. For example, if you are holding 5 and 7, the sum of your fates is 12, so you can play either fate on Leviathan. If you play the 7, your allies will know that your remaining fate plus 7 cannot be less than 11, so you must have a 7 (7+7 = 14), 6 (7+6 = 13), 5 (7+5 = 12), or 4 (7+4 = 11). If you play the 5, your allies will know you have a 7 (5+7 = 12) or 6 (6+7 = 12). This card functions similarly to The Deep and The Key. "5-6-7: If one of your fates is 5, 6, or 7, and the other is not, play the 5, 6, or 7 here." Q: How does The Lord work? A: When checking to see if you can play on The Lord, it helps to think of two groups of fates: the fates that The Lord wants (5, 6, 7) and the fates that he doesn't want (1, 2, 3, 4). If you have one fate he wants and one he doesn't, you can play the fate he wants on The Lord. If you have two fates he wants or two fates he doesn't, you can't play anything on The Lord. This card functions similarly to The Noble and The Servant. "Lower: If one of your fates is lower than the other, play the lower one here." Q: How does Midnight work? A: Like Dawn, Midnight is one of the simpler cards, so there's not much else to say. You can always play the lower of your two fates on Midnight, unless both of your fates are exactly the same -- in this case, neither one is lower. This card functions similarly to Dawn. "Same: If both of your fates are the same, play one of them here." Q: How does The Mirror work? A: The Mirror is perhaps the simplest card in the game. You can only play one of your fates on The Mirror if both of your fates are exactly the same -- and when you do, your allies will immediately know exactly what your hidden fate is. However, it's very rare that you'll actually be able to play on The Mirror, so it often just helps your allies by eliminating the possibility that your two fates are the same. "3-4-5: If one of your fates is 3, 4, or 5, and the other is not, play the 3, 4, or 5 here." Q: How does The Noble work? A: Similar to The Lord, when checking to see if you can play on The Noble, it helps to think of two groups of fates: the fates that The Noble wants (3, 4, 5) and the fates that she doesn't want (1, 2, 6, 7). If you have one fate she wants and one she doesn't, you can play the fate she wants on The Noble. If you have two fates she wants or two fates she doesn't, you can't play anything on The Noble. This card functions similarly to The Lord and The Servant. "Match: If one of your fates matches a visible fate, play your other fate here." Q: How does The Prophet work? A: Visible fates are those fates which have previously been played and are now in front of the 4 arcana cards currently in play. You may play a fate on The Prophet if and only if the other fate in your hand matches the value of one of these visible fates. If both fates in your hand match the values of visible fates, you may play either one on The Prophet. 2 and 5: You can play the 5 on The Prophet because your other fate matches the visible 2. 2 and 6: You can play either of them on The Prophet because regardless of which one you play, the other one will match a visible fate. 4 and 5: You cannot play either of them on The Prophet because regardless of which one you play, the other one will not match a visible fate. "Unique: If both of your fates are unique from each other and all visible fates, play one of them here." Q: How does The Rider work? A: Visible fates are those fates which have previously been played and are now in front of the 4 arcana cards currently in play. You may play a fate in front of The Rider if and only if neither of your fates matches the value of any of these visible fates, and only if your 2 fates do not match each other's values. 2 and 5: You cannot play either of them on The Rider since your 2 matches the visible 2. 6 and 6: You cannot play either of them on The Rider since your fates match each other. 4 and 5: You can play either of them on The Rider because neither one matches the other or any visible fate. "1-2-3: If one of your fates is 1, 2, or 3, and the other is not, play the 1, 2, or 3 here." Q: How does The Servant work? A: Similar to The Lord, when checking to see if you can play on The Servant, it helps to think of two groups of fates: the fates that The Servant wants (1, 2, 3) and the fates that he doesn't want (4, 5, 6, 7). If you have one fate he wants and one he doesn't, you can play the fate he wants on The Servant. If you have two fates he wants or two fates he doesn't, you can't play anything on The Servant. This card functions similarly to The Lord and The Noble. "4 Apart: If the difference between your fates is 4 or more, play one of them here." Q: How does The Shore work? A: Look at the fates in your hand and figure out the difference between them by subtracting the smaller fate from the larger one. If the difference is 4 or more, you can play either of your fates on The Shore. 1 and 3: The difference is 2 (3-1 = 2), which is less than 4, so you can't play here. 1 and 5: The difference is 4 (5-1 = 4), so you can play on The Shore. 2 and 7: The difference is 5 (7-2 = 5), so you can play here. 6 and 7: The difference is 1 (7-6 = 1), which is less than 4, so you can't play here. 7 and 7: The difference is 0 (7-7 = 0), so you can't play either one on The Shore. "Odd: If the sum of your fates is odd, play one of them here." Q: How does The Stranger work? A: Add together the values of both your fates. If the sum is an odd value (1, 3, 5, 7, 9, 11, 13, etc.) then you can play either fate on The Stranger. If the sum is an even value (2, 4, 6, 8, 10, 12, 14, etc. ), then you can't play either fate here. Remember that the sum of two even values is always even, and the sum of two odd values is always even, too. The only time that the sum of two values is odd is if one of the values is odd and one is even. So, if you play an even value on The Stranger, your allies will know that your hidden fate is odd, and if you play an odd value, they'll know your hidden fate is even. This card functions similarly The Judge. "Difference: If the difference between your fates is equal to a visible fate, play your higher fate here." Q: How does Asunder work? A: Look at the fates in your hand and figure out the difference between them by subtracting the smaller fate from the larger one. Then look at all the fates in play and see if a visible fate has the same value as that difference. If one does, you can play the higher of your fates on Asunder. 2 and 5: The difference of your fates is 3, which is not a visible fate. You cannot play on Asunder. 6 and 6: The difference of your fates is 0, which is not (and can never be) a visible fate. You cannot play on Asunder. 4 and 5: The difference of your fates is 1, which is a visible fate. You can play your 5 on Asunder. Q: What if there are no visible fates? A: You cannot play either of your fates on Asunder in this case, as there is no visible fate whose value is equal to the difference of your fates. "1-4-7: If one of your fates is 1, 4, or 7, and the other is not, play the 1, 4, or 7 here." Q: How does The Captain work? A: Similar to The Lord, when checking to see if you can play on The Captain, it helps to think of two groups of fates: the fates that The Captain wants (1, 4, 7) and the fates that she doesn't want (2, 3, 5, 6). If you have one fate she wants and one she doesn't, you can play the fate she wants on The Captain. If you have two fates she wants or two fates she doesn't, you can't play anything on The Captain. This card functions similarly to The Lord, The Noble, and The Servant. "Draw: Play one of your fates here, draw a fate, and continue your turn. You may not play here again." Q: How does The Feast work? A: The Feast allows you to "cycle" one of your fates, getting rid of it for a chance at something better. It's not very useful by itself; instead, use it if you have no good play on any other arcana cards, and you think playing on The Feast may allow you to get a better pair of fates for playing elsewhere. For example, say that you are holding a 1 and a 7, and The Feast and Midnight ("Lower") are in play. You could play your 1 on Midnight, but this won't tell your allies much. You play your 1 on The Feast instead and draw a new fate. It's a 6! You're now holding a 6 and a 7. You play your 6 on Midnight, giving your allies a lot of information about your remaining fate. Once per turn: Remember that you can only play on The Feast once per turn, so if you draw new fates that still aren't very good, you'll have to live with them. Fading: If The Feast gains enough fates in front of it to cause it to fade, it fades at the end of the turn along with any other cards that fade this turn. Depending on where else you play after playing on The Feast, you may actually cause multiple cards to fade in a single turn, suffering the penalty (2 doom) for each one! If your allies make a correct prediction, they'll still avoid all fading penalties for the turn. The Hours: If you play on The Feast, but the new fate you draw doesn't allow you to play on any of the 3 other arcana cards, you'll have to play on The Hours. You can't play on The Feast again. If The Feast is next to The Hours, the fate you play on The Hours will still slide over onto The Feast. "High Odds: If your fates are unequal and both odd, play your higher fate here. If only one is odd, play your lower fate here." Q: How does Fortune work? A: What fate you're allowed to play on Fortune changes based on what fates you have. If both of your fates have the same value, you can't play on Fortune. If both of your fates have even values, you can't play on Fortune. If both of your fates have odd values, you can play your higher fate on Fortune. If one of your fates has an odd value (and the other is even), you can play your lower fate on Fortune. Two 1s: Your fates are the same, so you cannot play on Fortune. A 2 and a 4: Both your fates are even, so you cannot play on Fortune. A 3 and a 7: Both your fates are odd, so you can play your higher fate (7) on Fortune. A 3 and a 6: Exactly one of your fates is odd, so you can play your lower fate (3) on Fortune. A 2 and a 5: Exactly one of your fates is odd, so you can play your lower fate (2) on Fortune. Q: What does this mean for my allies? If you play an odd fate on Fortune, your allies know it has to be your higher fate (if your other fate is odd) or your lower fate (if your other fate is even). Your remaining fate must be even and higher or odd and lower than the one you played. It can't be the same as the odd number you played. If you play an even fate on Fortune, it has to be your lower fate. Your allies know that you had one odd and one even fate, so your remaining fate must be odd. Additionally, because you played your lower fate, your remaining fate is higher. Your remaining fate must be odd and higher than the one you played. "Alone: If no visible fate is exactly 1 more or 1 less than either of your fates, play one of them here." Q: How does The Ghost work? A: Look at each of your fates and see if any visible fate is 1 more or 1 less than it. If the answer is yes, you can't play on The Ghost. However, if you can't find any visible fate that's 1 more or 1 less than either of your fates, you may play either of your fates on The Ghost. 2 and 5: The visible fate 1 is 1 less than your 2, and the visible fate(s) 6 are both 1 higher than your 5. You cannot play on The Ghost. 3 and 4: The visible fate 2 is 1 less than your 3. You cannot play on The Ghost. 4 and 4: The only visible fates that would be 1 more or 1 less than 4 would be 3 and 5. Neither of those is visible, so you can play either of your 4s in front of The Ghost. 1 +1: Rules out 2. 2 +1 or -1: Rules out 1 and 3. 6 +1 or -1: Rules out 5 and 7. Collectively, they've ruled out 1, 2, 3, 5, and 7. So you must have either a 4 or 6. Not bad! "Delay: Play one of your fates here. A 7 played here only counts as 1 <> towards fading." Q: How does The Imago work? A: You can always play either of your fates on The Imago. 7s played on The Imago only count as 1 <> when calculating whether the card is about to fade, instead of their normal value of 3 <>. This has a few unusual uses. For example, The Imago means it is possible to have far more visible 7s in play than otherwise, which can help other cards that care about visible fates such as The Ghost or The Prophet. Additionally, a player holding a 7 may be incentivized to play it on The Imago, which may mean players that choose not to play on The Imago are not holding on to a 7. "Rising: If one of your fates is higher than my highest visible fate, play your other fate here." Q: How does Iron work? A: Iron is all about building upon the fates that have already been played in front of Iron. If there are no visible fates in front of Iron: Any fate in your hand will be playable on Iron. Example: There are no fates in front of Iron, and you are holding 1 and 2. You may play either fate in front of Iron. Your allies will not be able to deduce anything about your remaining fate from this play alone. If there are one or more visible fates in front of Iron: Look at the fates in your hand to see if one of them is higher than the highest visible fate in front of Iron. If one of yours is higher, you may play the other fate in your hand on Iron. Example: If 1 and 3 are in front of Iron, and you are holding 2 and 6, you may play the 2 in front of Iron because your other fate (6) is higher than Iron's highest fate (3). You may not play the 6 because your other fate (2) is not higher than Iron's highest fate (3). Example: If 1 and 3 are in front of Iron, and you are holding 5 and 6, you may play either of your fates in front of Iron, because no matter which one you play your remaining fate will still be higher than Iron's highest fate (3). If there is a single 7 in front of Iron: No more fates can be played on Iron! If this happens, Iron will never fade because additional fates will never be able to be played in front of it. It effectively becomes a dead card in your 4th arcana card slot. However, if Iron is next to The Hours, it may still fade when fate slides off of The Hours and onto Iron. Additionally, faded powers that add, remove, or relocate visible fates may be used to affect Iron. Example: If there is a single 7 in front of Iron, and you are holding 7 and 7, you cannot play on Iron because neither of your fates is higher than the highest fate in front of Iron (7). The faded powers Shadows ("+1") and Skies ("Relocate") can potentially be used to help keep Iron from remaining stuck. Q: What if multiple fates with the same value are in front of Iron? A: It will behave as described above, since Iron only cares about the single highest fate in front of it. If there are more than one, pick one; everything will still work the same. For example, if 1, 3, and 3 are in front of Iron, all that matters is that the highest fate is a 3. "All x4: If the sum of your fates plus all visible fates is a multiple of 4, play one of your fates here." Q: How does The Lantern work? A: Add together the values of your two fates plus all visible fates in front of arcana cards. If the sum is a multiple of 4 (4, 8, 12, 16, 20, 24, 28, 32, etc. ), then you can play either of your fates on The Lantern. If the sum is anything else, you can't play here. 2 and 5: The the sum of your fates is 7 (2+5 = 7), and the sum of all visible fates is 15 (1+2+6+6 = 15). The sum of your fates plus all visible fates is 22 (7+15 = 22), which is not divisible by 4 (20 and 24 are, but 22 is not). You cannot play on The Lantern. 3 and 6: The sum of your fates is 9 (3+6 = 9), the sum of all visible fates is 15, and the sum of your plus all visible ones is 24 (9+15 = 24), which is divisible by 4. You can play either one of your fates on The Lantern. If you play the 3, your allies will know that 3+?+15 is divisible by 4. Since 3+15 = 18, you could be holding a 2 (2+18 = 20) or a 6 (6+18 = 24). If you play the 6, your allies will know that 6+?+15 is divisible by 4. Since 6+15 = 21, you could be holding a 3 (3+21 = 24) or a 7 (7+21 = 28). While it looks at more fates than just the ones you're holding, this card functions similarly to The Engine. "Within 2: If the difference between your fates is 1 or 2, play one of them here." Q: How does The Pallbearers work? A: Look at the fates in your hand and figure out the difference between them by subtracting the smaller fate from the larger one. If the difference is 1 or 2, you can play either one on The Pallbearers. If the difference is larger than 2, or if the difference is 0 (because both fates are the same), you can't play here. This card functions similarly to a combination of The Beast and The Huntress. "Between: If exactly one visible fate falls between your fates, play one of them here." Q: How does The Passage work? A: If only one visible value (which might appear on more than one visible fate) falls between your two fates' values, then you can play one of your fates on The Passage. Look at each visible fate value and ask "Is that value higher than one of my fates, and lower than the other?" If the answer is "Yes," then that value falls between your two fates. If no visible values fall between your fates, or if two or more visible values fall between your fates, then you can't play on The Passage. 2 and 5: The values 3 and 4 would fall between your fates, but neither one is visible. You cannot play on The Passage. 1 and 7: The values 2, 3, 4, 5, and 6 would fall between your fates. Both 2 and 6 are visible. Since more than 1 visible value currently falls between your fates, you cannot play on The Passage. 2 and 7: The values 3, 4, 5, and 6 would fall between your fates. Only the value 6 is visible (on two different fates). 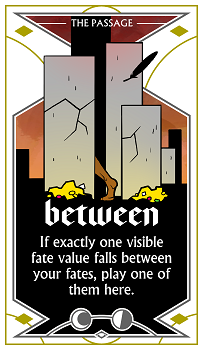 Since exactly one visible value (6) falls between your fates, you may play either of your fates on The Passage. 1? If this fell between your 2 and your other fate, your other fate would have to be lower than 1. That's impossible, so this isn't the one that's between your fates. 2? 2 can't fall between 2 and anything else, as it's neither higher nor lower than 2. 6? This is the only option left, and it could fall between your fates is one of them (2) was lower than 6, and the other (?) was higher than 6. In this case, that means your other fate must be a 7, since no other value would be higher than 6. Nice! "Guess: Play one of your fates here. If you do, your allies may make one extra prediction this turn." Q: How does The Wish work? A: You can always play either of your fates on The Wish, and doing so conveys no information to your allies by itself. However, they are allowed to make two predictions this turn while trying to guess your hidden fate. If your hidden fate was narrowed down (but not guessed) during a previous turn, The Wish may give your allies a better chance at success. Alternatively, as with many cards that convey "no" information when played on, The Wish may inadvertently let your allies know that you couldn't play anywhere else, which is useful in and of itself. Q: If my allies guess twice but one of the predictions is wrong, does doom advance? A: Not if the other guess is correct. Doom only advances if all predictions are wrong. Additionally, doom only advances a single time, regardless of how many wrong predictions are made. For example, if The Wish grants an extra prediction, and your allies use the Sorrows ("Twice") faded power to make an extra prediction, it is possible that they might make as many as three incorrect predictions in a single turn. Even if this happens, the doom still only advances once as a penalty for the failed predictions. If any of the three predictions are correct, doom does not advance at all. "Fragile: Play a 7 here. Each turn: I fade if a 1 or 2 was played anywhere this turn." Q: How does The Ash work? A: The only fates which can be played on The Ash are 7s. All other fates cannot be legally played on it. Separately, whenever a 1 or a 2 is played on any card in play, The Ash fades at the end of the turn. Q: When exactly does The Ash fade? A: At the end of the turn, alongside any other cards which are fading this turn. It also incurs 2 doom as per the usual fading rules. This 2 doom is in addition to the doom incurred by other cards fading this turn. Of course, if the group makes a correct prediction, all doom caused by fading this turn will be prevented, and the group will score 1 point. This is regardless of how many cards faded this turn. Q: How many moons does The Ash have? A: None. It has a comet indicator instead, meaning that it fades based on special conditions as described in its game text. For The Ash, that special condition is whenever a 1 or 2 is played. Q: What if there are 1s or 2s already in play when The Ash enters play? A: The Ash ignores any fates already in play. It only cares about new 1s or 2s that are played. Q: What if a 1 or 2 is played but then we get rid of it with a faded power like Sinners (Discard Lower) or Sails (Exile)? A: Even if the offending 1 or 2 is removed from the board, The Ash will still fade because a 1 or 2 was played this turn. Q: What if I play a 1 or 2 on The Hours? A: The Ash will still fade at the end of the turn. Q: Can The Ash have other fates in front of it besides 7s? A: Yes, potentially. You can’t play fates in front of it unless they’re 7s; however, you could use a faded power such as Skies to relocate other fates onto The Ash. Because The Ash has no moons, adding additional fates onto it still won’t cause it to fade. You can even move 1s or 2s onto it — as long as they were played before The Ash entered play! "Inevitable: Play one of your fates here. Each turn: I fade if the sum of my visible fates is at least twice your hidden fate." Q: How does The Fall work? A: You can always legally play any fate onto The Fall. Separately, after you are done playing fates on your turn, you must then announce whether The Fall will fade this turn. The Fall can fade even if you play somewhere else. Q: If I no longer have a hidden fate at the end of the turn, does The Fall still fade? A: Yes. Once you are done playing fates for the turn, The Fall fades (or doesn’t fade) based on the value of the hidden fate you hold onto. Even if the group makes a prediction, causing you to reveal and discard your hidden fate, The Fall still fades based on the value of the hidden fate you were holding. Q: When is the group allowed to know if The Fall will fade this turn? A: Once the active player is done playing fates, they must inform the group about whether The Fall will fade this turn. In addition, if the answer changes (for example, by using faded powers), the active player must update the group on whether The Fall will fade. Basically, the group should always have accurate information about whether The Fall is fading as they make their deductions. For example, there is a 1 on The Fall, and you are holding a 3 and 2. You play the 3 on The Fall, and announce that it will fade this turn. You then use the faded power Skies to relocate the 1 from The Fall to another arcana card. You now inform the group that The Fall is no longer fading this turn. Other powers that might change whether The Fall is fading include Sinners (Discard Lower), Shadows (+1), and Sails (Exile). Q: How does the faded power Sails (Exile) interact with The Fall? A: Sails is a unique case, because it’s used after you’ve already revealed and discarded your hidden fate as part of a correct prediction. You’ll still tally the sum of all fates remaining in front of The Fall after using Sails, and compare them to the hidden fate that was correctly guessed. If exiling one fate away causes the remaining sum to no longer be twice the hidden fate’s value, The Fall will no longer fade this turn. "Make 11: If the sum of your fates plus up to one visible fate is 11, play one of your fates here." Q: How does The Musician work? A: Add together the values of both your fates. If the sum is 11, you can play on The Musicians. If the sum isn’t 11, look at each visible fate. If the sum of one of them plus your two fates is 11, you can play on The Musicians. You may not indicate to the group which visible fate you added to your fates, if any. For example, if you are holding 5 and 2, and a 4 and 7 are visible, the sum of your fates plus 4 is 11, so you can play either fate on The Musicians. If you play the 5, your allies will know that your remaining fate could be a 6 (5+6=11) or 2 (5+2+4=11). The visible 7 can’t be part of the equation, as 5+7 already exceeds 11, without even adding in your hidden fate. If you play the 2, your allies will know you must be including one of the visible fates, since 2+9=11 and there is no 9 fate. So you must have a 5 (2+4+5 = 11) or 2 (2+2+7 = 11). "Fragile: If one of your fates has exactly 1 more ♢ than the other, play one of them here." Q: How does The North Wind work? 1s, 2s, and 3s have one pip (♢). 4s, 5s, and 6s have two pips (♢♢). 7s have three pips (♢♢♢). To play on The North Wind, one of your fates must have exactly 1 more pip than the other. If one of your fates is a 1, 2, or 3, and the other is a 4, 5, or 6. If one of your fates is a 4, 5, or 6, and the other is a 7. If one of your fates is a 1, 2, or 3, and the other is a 7, since the difference in pips is too large. If both of your fates are 1s, 2s, and/or 3s, since they all have the same number of pips. Likewise, if both of your fates are 4s, 5s, and/or 6s. "Fragile: After playing somewhere else: Move a visible fate higher than your hidden fate from another card to this one, if possible." Q: How does The Thief work? A: You can never play a fate directly onto The Thief. However, after you play on another card, you must then move one fate from in front of any other card onto The Thief, if that fate is higher than your hidden fate. This may change which cards fade at the end of the turn. Q: What if no visible fate is higher than my hidden fate? A: Announce that you cannot move any visible fates onto The Thief. Q: What if I use a faded power to change my hidden fate? A: What a particular question! Okay. Say you are holding a 2 and 3. You play the 3 onto an arcana card. Because the 3 is higher than your hidden 2, you must now move it onto The Thief. However, before you announce whether or not any fates will be moved onto The Thief, you use the Shadows (+1) power to treat your hidden fate’s value as +1. Because your hidden 2 is now treated as 2+1=3, no visible fates are higher than your hidden fate. You would then announce that you cannot move any fates. The important thing here is that once you play your fate, you either need to resolve The Thief immediately, or use a power immediately, then resolve The Thief. One way or another, the group should know what (if anything) The Thief has been able to steal before they begin their deliberations. You can’t wait around listening to them for a while before choosing to activate The Thief. Q: What happens when I play on The Hours and The Thief is next to it? A: Fates played on The Hours slide to the right, onto the leftmost arcana card. Perform this move before having The Thief steal a fate. 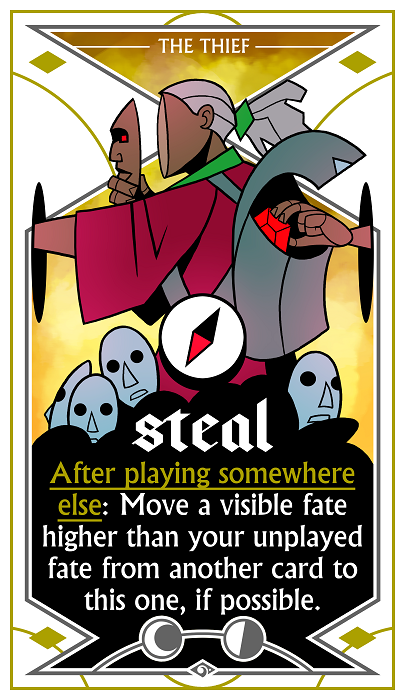 That means the fate played on The Hours is not available for The Thief to steal, since the stolen fate must come from a card other than The Thief.